After over 50 years of mostly empty promises and disappointments, so-called artificial intelligence has finally produced some impressive results— IBM’s Deep Blue beating the world’s champion at chess and Jeopardy, and now doing practical work in medical applications such as interpreting X-rays for signs of cancer; self-driving cars; personal assistants; and many others. With these new developments has come a new belief in the possibility not only of equaling human intelligence but surpassing it. 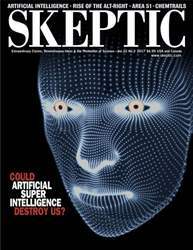 Along with the usual fervent AI advocates such as Ray Kurzweil, sober thinkers and scientists including Sam Harris, Bill Gates, Stephen Hawking, Elon Musk, and Neil DeGrasse Tyson believe we are imminently and inevitably facing the tipping point at which artificial intelligence exceeds human intelligence—an event that has been dubbed with what can only be described as theological fervor as the Singularity. With humans no longer the measure but only a way-station along the path to bigger and better, the quest is no longer for human-level artificial intelligence (once the Holy Grail of the field) but something even better that has been termed artificial general intelligence (AGI). And with superintelligent computer programs running on supercomputers designing their successors, these thinkers believe a runaway effect should take place, leaving human beings in the dust. Just how plausible is that? The word artificial has two primary meanings: synthetic— for example, artificial light is physically and functionally identical to natural light; and simulated—for example, artificial grass is a convincing simulacrum of natural grass—and so can be used as a decorative substitute or as a playing field for sports such as baseball and football—but may be missing desirable qualities of the natural. Except in Mission: Impossiblemovies and the like, simulation isn’t necessarily malign or deceitful. Simulation has many useful applications, including training (flight simulation and CPR dolls); testing (crash test dummies); and even entertainment (immersive rides and virtual reality). In some of these domains (especially flight trainers), simulation obviously has enormous benefits and advantages over reality. Synthesis, though, has a much broader range of benefits. Synthesized natural drugs, for example, can often be made more quickly, safely, and in larger quantities than from their natural sources; variations on natural organic substances can be generated and tested, leading to improved efficacy. Artificial (that is, synthetic) light can be produced wherever and where it’s needed, and with much greater intensity. LEDs, LCDs, and lasers (all of which produce their own kinds of synthetic light) have applications that are inconceivable using only natural light. In the research proposal that inaugurated the field of artificial intelligence in 1956, the initial goal (stated with breathtaking naïveté and hubris) was clearly synthesis. In reality, however, the field has become devoted largely to simulation. One might even say that the field of artificial intelligence is simulating the synthesis of intelligence. Confusion between simulation and synthesis is the root of a lot of muddled thinking.